My earliest memory of growing up is… jumping out of the family automobile before it completely stopped and running into the house to my Great-Grandmother White Buffalo Woman, who happily greeted me as she pulled me lovingly into her arms and softly spoke to me as I touched her face and pulled at her braids, and at that moment only the two of us existed in the world. My great-grandmother, White Buffalo Woman, was old enough to remember… the years following the 1851 Treaty of Fort Laramie, the 1864 Massacre at Sand Creek in Colorado Territory, the 1868 Battle of the Washita (Lodge Pole River) in Indian Territory, and reluctantly reporting to the reservation, which broke the people’s connection to the horse and buffalo. Nowadays I am happy to just… read, listen to music on the television, and teach the Cheyenne language as a master speaker when I am not traveling to board meetings, speaking engagements, cultural gatherings, and visiting family out-of-state. As a spiritual mentor my goal is one of… living what I teach, humbly walking the spirit road of my ancestors, and living the values of a member of the spiritual community. My best memories of Montana always took place… when each student of mine walked out of my classroom carrying knowledge of the first peoples of this land, and also knowing that I was rearing my children in what I visualize as my personal paradise. Wisdom is… the ancient and enduring knowledge of the Cheyenne people, their profound teachings about the interdependent nature of the world in which we live, and ways of life that are rooted in the sacred soil of this island home of ours. One thing most people do not know about the Cheyenne Tribe is… that the Cheyenne woman holds a very high position in the Lodge of New Life, better known as the Sun Dance. The film that I believe most accurately depicts Native Americans is… How the West Was Lost. When Rolling Stone once named me as one of the 10 leading professors in the nation I… was completely overwhelmed that my students/associates thought to nominate me for this honor, despite learning from Rolling Stone that some of my students referred to me as “Dragon Lady” because I held them to exacting high standards. My daily routine always includes time for… maintaining the life of a ceremonial elder, and sincerely and joyfully welcoming all who come to my home. One thing my best friends don’t even know about me is… that I value complete solitude. Prayer, for me, is something that… is highly personal, but which is a way of being thankful for all of life’s gifts, asking for strength for all peoples, including those who have no voice, maintaining our role as responsible stewards of this earth, and for carrying on the ancient, spiritual traditions of the Cheyenne people. Because of my work on “blood quantum” (the percentage of tribal blood required to become an enrolled member of an American Indian tribe) I now understand that… it is the responsibility of each tribal nation to institute visionary membership requirements that prevent their extinction as a people. When I want to treat myself to something special it usually involves… going shopping for prized blankets and other cultural items that I share with those in need of such for a giveaway, or to give to someone as a way of showing honor. My most powerful memory over the last many decades is… going to Ground Zero on November 13, 2001, accompanied by my daughter where we offered prayers for all whose lives were lost there, their families, for all working there, especially the Native American high steel construction workers, who were doing the most dangerous work. Life brings many disappointments. My greatest disappointment was… the imposed oppression of indigenous peoples, by the federal government, church, and education, which resulted in land loss under Manifest Destiny, assimilation, spiritual denigration, and language deprivation, which has continued throughout my lifetime. Please, don’t ever ask me to… be creative or constructive with my hands, which has never been a trait of mine, partially because of being left-handed, and my mother would encourage me to read books instead, which has resulted in my love of reading. beading and creating cultural items of beauty and elegance. For me, a sacred ground will always be… a place where Native Americans go to pray, make offerings, strengthen their identity, and seek guidance for the heart and spirit. The five words I would like to see in my epitaph are… humble, compassionate, prayerful, human, and hopeful. Dr. Henrietta Mann, Tsetsehestaestse (Cheyenne) was Director/Professor in Native American Studies at the University of Montana, Missoula for some 28 years. In 2000 she became the first individual to occupy the Katz Endowed Chair in Native American Studies at Montana State University, Bozeman where she is Professor Emerita, and was Special Assistant to the President from 2003-2016. She is the founding President of the Cheyenne and Arapaho Tribal College. In 1991, Rolling Stone Magazine named Dr. Mann as one of the 10 leading professors in the nation. In 2008 she received the Lifetime Achievement Award from the National Indian Education Association. 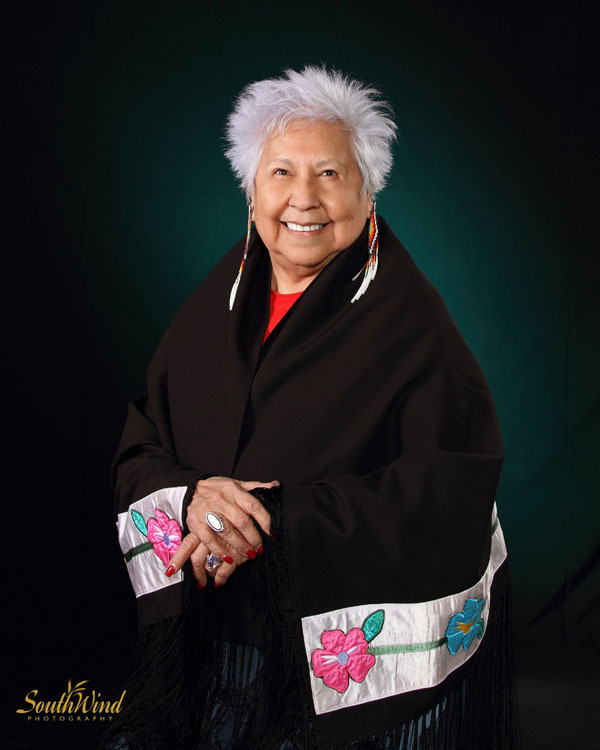 The Native American Student Advocacy Institute (NASAI) presented her with its first Lifetime Achievement Award in 2013, and has since created the Dr. Henrietta Mann Leadership Award to thank leaders for their advocacy in improving lives within native communities. In 2014 Money Magazine named her one of 50 Unsung Heroes/50 States, conferred for her work with the Cheyenne and Arapaho Tribal College in improving the financial well-being of others. She has received many more honors.